Find hotel near Norwest Underworld Advent .. The Norwest Underworld Adventures was established in the year 1987 and since then has been attracting people who are looking forward to a fun-filled day. There are four distinct karst and cave experiences that have been created so that the visitors get to enjoy the natural wilderness. Attractions here at Norwest Underworld Adventures include underworld rafting, glow-worm cave tour, adventure caving and the rainforest train. The rafting and cave tours are the best way to explore the spectacular Stalagmite and Stalactite creations. Adventure caving is a great way to experience the active water cave complete with crawls, climbs and squeezes while the train ride lets you enjoy the untamed wilderness of the area. Beautiful cave and a long walk through it. To swim with the ring under the glow worms is amazing and paddling in the river back to the train is funny. Staff is very friendly. 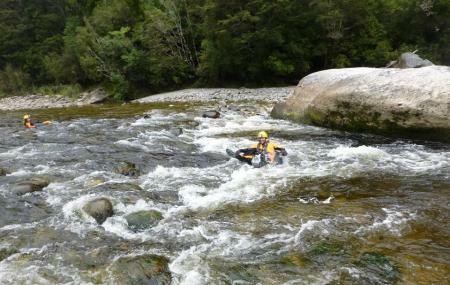 Both the tubing trip through the Metro cave and their adventure cave trip through Te Tahi we well run and fun. The size and beauty of Metro just blew me away, the glow worm display was one of the brightest I have seen underground and their train ride was a lovely way to see the rain forest.